In 1891, Eugene Ware established the Ware Public Library in Fort Scott. 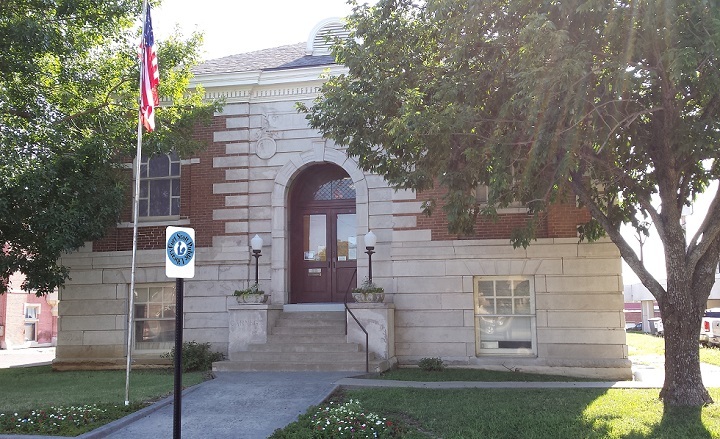 After Mr. Ware donated his library collection to the City of Fort Scott in 1894, the citizens voted to establish a free Fort Scott Public Library to be maintained by the taxpayers. In 1902, Andrew Carnegie donated $18,000 for the construction of a library building. Fort Scott Public Library opened in its present location in 1904. In the mid-1980s, the library automated and began using computers instead of a card catalog. In 2013, Fort Scott Public Library joined the SEKnFind consortium, a group of over 40 Southeast Kansas libraries. We have access to the catalogs and collections of all these libraries. In 2014, Fort Scott Public Library joined the Sunflower eLibrary consortium, giving our patrons access to ebooks, audiobooks, and videos. In August of 2016, the library temporarily moved into the old City Hall offices in Memorial Hall, so that the library building could undergo a major renovation. In April of 2017, the library reopened in the newly remodeled original Carnegie building. Improvements included an up-to-date electrical system, new heating/air, new lighting, new flooring, new furniture, a new event room (for library events and available to the public), improved WiFi services, and an improved public computer area.